This week only save over 46% on all Ukulele Tricks courses and songbooks when you purchase the All-In-One Ukulele Tricks Super Bundle. It’s never been a better time for you to take your ukulele playing to the next level. Note: This offer expires this Tuesday, November 28, 2017 at 11:59pm eastern timezone. Two flagship courses and two songbooks are included with the bundle. If you were to click the above links and purchase all these courses and songbooks separate, the total cost would be $183.98. For this week only purchase all four products for just $97. This is more than a 46% savings ($86.98 total savings). Once you complete your purchase, you’ll be redirected to the Ukulele Tricks Member Area where you can access all the courses and songbooks and all their contents. No. 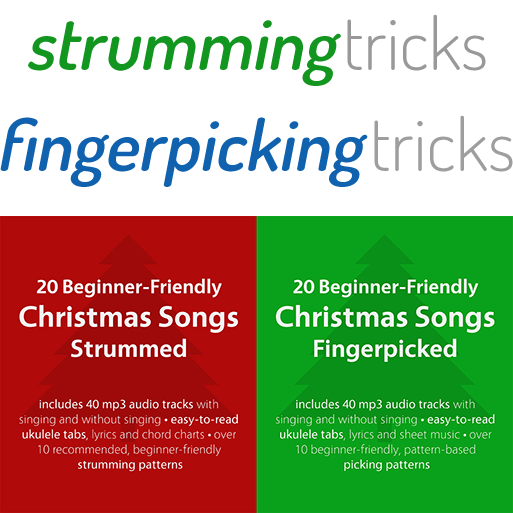 The bundle is available for you to download in the Ukulele Tricks Member Area upon purchase. You have unlimited access to the courses and songbooks. Your membership never expires. Sorry, we do not offer our courses or songbooks on DVD or in print. Absolutely! You have everything you need in this bundle to become a proficient ukulele player.